What might it have been like for those first and second-generation Christians to feel so overwhelmed by the stress of bearing the label “Christian” that they considered abandoning their faith? Had the weight of the faith they maintained become too burdensome to carry? The ultimate purpose of Hebrews was to encourage and restore those who were once faithful. In its form, however, Hebrews is a unique book. It is generally designated as a letter and is placed among a number of similar New Testament books. Yet, it stands out from those around it like a Sunday morning necktie at a Saturday night contemporary worship service. It is stately and polished in the midst of nitty-gritty letters full of busy instructions. Despite a rocky beginning, Hebrews found a place in the New Testament collection. It often played an important role in theological controversies at a time when a traditional path of Christian belief and thinking was beginning to emerge from the early streams of practice. The book’s distinctive portrayal of Jesus’ nature was influential during early debates about Christ’s divinity and humanity. And its use of the Old Testament helped pave the way for centuries of biblical interpretation based allegory and typology. Simply put, Hebrews is like a multimedia presentation intended to inspire and encourage its audience. 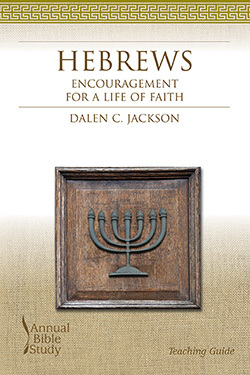 The author of Hebrews was a holy artist, communicating good news to a particular community of believers and addressing their needs in their context. Nonetheless, the images are timeless and their inspiration may be new again as God works in our own imaginations. Receive encouragement for your life of faith with the 2006 Annual Bible Study. Both the Teaching Guide and Study Guide, which are illustrated with art images, photos, and maps, were written by Dalen C. Jackson. Each chapter in the Hebrews Teaching Guide includes teaching options, a suggested worship outline for both a contemporary and traditional service, and approaches for leading discussions. The study examines biblical background, historical interpretation, as well as spiritual, ministerial, and theological themes. It also includes relevant lesson plans for children and youth. The Hebrews Study Guide serves three purposes: to educate the learner on major issues of appropriate interpretations, to offer an overview of theological themes, and to build the learner’s Bible study skills by considering several significant interpretations.